Please note that the above list is subject to change. We can’t guarantee that there will be stock available at all times. To reflect our direction to an organic system, we have changed our packaging style and design. Our new packaging is a bright blue pulp and made for us by the innovative packaging company Hartmanns. 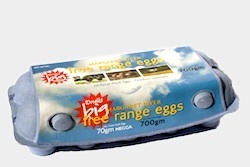 The egg packs are made from 100% recycled paper, 100% biodegradable and CO2 Neutral! 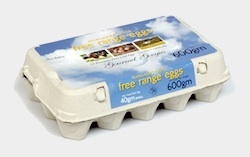 We are not only impressed with the quality of their egg packaging, but also the company’s value and environmental management systems. Ahead of its time, Hartmanns has for many years now put these important values and principles into practice and recently received the prestigious and coveted “European Management Award for Sustainable Development”. 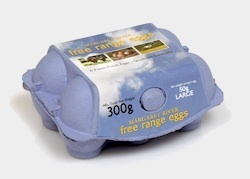 Although they cost a little more than standard egg packaging, we feel that our customers will appreciate their quality and contribution to non-polluting packaging. Most impressive is the design of the packaging which ensures protection and care (absorbs moisture but allows active exchange of oxygen) for the egg. It is the only egg packaging to be awarded a certificate of recognition by the World Hanicap Society which acknowledges the design’s user friendly style. You will notice the difference and we hope you like it. 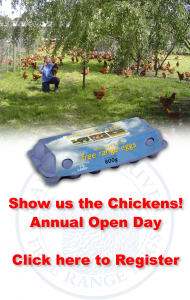 Most Restaurants in the Margaret River area such as Elkamo and Morris use our eggs, as do many of the quality accommodation houses including Basildene Manor and Cape Lodge. Most Cafes in Margaret River buy our eggs including Sea Gardens, White Elephant, The Noshery, Riversmith, Urban Bean and Blue Ginger.